Michael DePasquale, Jr. was quite literally born to be a Martial Arts Master. The son of Michael DePasquale Sr., Grandmaster of the Yoshitsune Waza style of Ju-Jitsu. 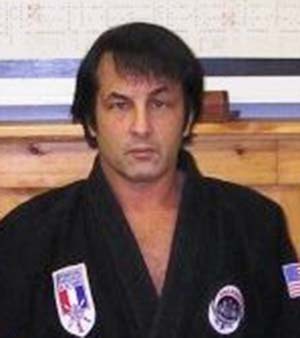 Michael Jr’s Martial Arts career began at the early age of five, with Yoshitsune Ju-Jitsu in which he presently holds the coveted rank of Ni Dai Soke (Heir to the rank of Grandmaster). He has completed and has been certified by the FBI Instructors’ program. Additional training: Bergen Community College:. Business Administration, Bomb seminar attendance, Security Management, Inc (specialized in knife and gun disarmament). Defensive and offensive knife techniques. Mr. DePasquale has also had training in evacuation skills. Regis Philbin (6 segm.) – Guest Speaker: Anti-crime / streetwise safety demo. Yo! MTV Raps – Guest Speaker: Anti-crime / streetwise safety demo. Attitudes – Guest Speaker: Handicapped / streetwise safety demo. The 700 Club – Guest Speaker: Handicapped / streetwise safety demo.